SAMAY (meaning Time in Hindi) starts afresh for us at Young India on an auspicious day – the 75th anniversary of the start of Mahatma Gandhi’s Salt March from Sabarmati Ashram to the coastal city of Dandi. As Bapu (Mahatma Gandhi) embarked on his journey with a deep conviction in his ideas and an unshakeable faith in nonviolence, so do we. Today our reach is very limited compared to Bapu’s influence on millions of Indians but in time we hope our work gains significance in more and more lives. We start this venture with the simple belief that if we bring to you information and ideas with sincerity and a sense of purpose our work will bear fruit. We hope and pray that our sincerity of effort deepens and together with our readers we can make a meaningful contribution not only to the discourse of our times but inspire action that accomplishes things for the weakest amongst us. For only then will justice be served. Our work shall not just be limited to analysis, but starting with this very first issue we will bring to you examples of nonviolence-in-action and other action alerts that can give you, our readers, an opportunity to be part of the action. We will also keep you informed about campaigns that we feel are under the radar and deserve far more attention than they are getting. So, for all this excitement stay with us. We hope you find our work useful. Congratulatory wishes from Congresswoman Ileana Ros-Lehtinen (R, FL-18), Republican Co-Chair of the Congressional India Caucus. From the past to the future. 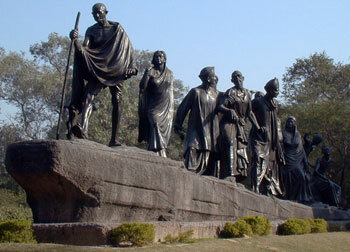 Where would Mahatma Gandhi march to today? The Right To Information is a pillar of democracy. Shailesh Gandhi talks of the critical role this Right plays in democracy and shares with us his own experiences in this battle. Mahatma Gandhi once said that non-cooperation with evil is as important as cooperation with good. Read this first-hand account of this nonviolent strategy in action today.Once again all this was possible because activists and citizens fought for the right to information. Many eminent personalities have graciously shared their reflections of Mahatma Gandhi and the Salt March with us. The government of India passed an ordinance on December 31,2004 that amended the Patents Act of 1970. This ordinance, which has to be ratified by the parliament by June 1, 2005, is aimed at bringing India into comliance with WTO regulations. Namely, the intellectual property regime also known as TRIPS. We feel that the government of India has NOT taken advantage of the flexibilities offered by TRIPS and thus have endangered the easy production of critical generic drugs in India and the developing world. If the amendments to the acts pass as they are then among other things the worldwide fight against AIDS will suffer a major setback. Prof. Arvind Panagariya (Columbia University) breaks this issue down for us.